There’s that creeping sensation of guilt that takes hold when you realize you haven’t done your homework, that you’ve been miraculously lucky up until now, to think that you’ve been in this city for a month, darting among traffic, standing on platforms two feet from moving trains, sending children to school and playgrounds without creating an emergency list, that go-to list of the places you should call or be taken if something should happen. Here was another school day missed and we had no clue where to take her. When the twins emerged from their apartment for school, I was outside their door waiting to talk to their parents. They let me in happily, though it’s a busy time for anyone, those moments after your kids get out the door and before you’ve gotten yourself ready for work. But they sat down at the kitchen table with me, pulled out their iPad and phones, and started the research. They had their own pediatrician but she was across town. For our purposes (short stay, no car) we wanted a closer location. They found one for us, and showed me on the map where it was located. They also gave me phone numbers for an ambulance and police (it’s not 911) as well as the name of the nearest hospital and where to go for urgent care. All things we should have assembled on day 1, but we had put off. I waited until M returned from accompanying C on her commute to school—two subways there, two subways back—and made him place the call explaining our situation and requesting an appointment. We could be seen at 11:15 a.m.
We walked the half-mile together, M carrying E on his back. We found the building without trouble, walked upstairs to the second floor, and I thought “just don’t break your leg!” and not for the first time, and we entered what looked like an apartment but was in fact a doctor’s office. One woman behind the desk spoke good English and was kind. We sat in the waiting room, which was very much set up for the benefit of children. Chairs lined the perimeter of the room, and a variety of toys covered the middle of the floor, things to climb on, trucks to push, blocks for building, and a shelf full of books. There were two other small children with their parents, and the children were toddlers and were toddling around, touching everything. They seemed fine until one of them let out a barking cough, and then the other one did, and then E coughed as well, a deep matching, barking sound, and all the parents smiled and nodded knowingly, having confirmed we’re all here for the same reason. 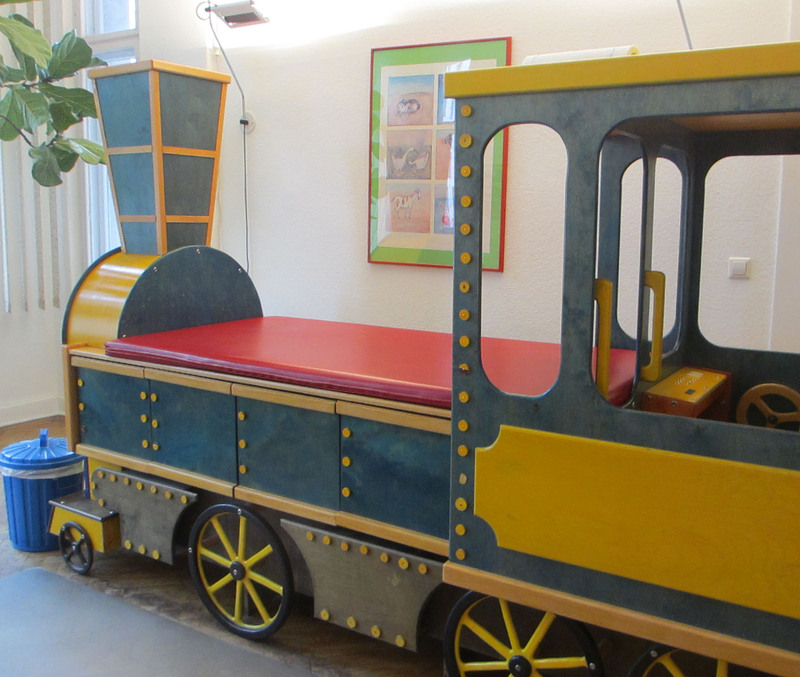 When the nurse called us in, we were taken to a room that looks like our living room, with long glass windows that swing open, and a wooden table and chairs, but the right side of the room filled with a large colorful wooden train that looked inviting for children to climb on. It looked like it belonged on a playground. You could climb in to turn the steering wheel and drive the train, or you could climb up the front part and sit on what we realized was the examining table, covered with vinyl and looking very friendly and not clinical at all. The doctor came in, dressed in jeans, sneakers and a polo shirt. M spoke to him in German, and I tried to follow along as the doctor asked E questions and looked down her throat. Like us, he suspected strep, and did the swab test that makes you gag. Rather than sending the long cotton swab down the hall with the nurse, he stirred it in a small tray and set it on the desk while we all talked and waited for it to develop. A few moments later he informed us it was not strep, and that he would write us a prescription for something for the fever and cough. As he typed out the small form, I wondered what this medication could be—surely not antibiotics if she didn’t have strep? He handed it to us, this typed, stamped, and twice-signed form—an official prescription for none other than Children’s Tylenol. We made our way to the front desk, where M explained that we would pay the bill in full now, and hopefully be reimbursed by our American health insurance company. The woman presented us the bill for 38 Euros, which is about exactly $50, same as the co-pay we would have paid for an Urgent Care visit back home. The bill was itemized, and the strep test caught my eye—the cost for the strep test was a whopping 1.80 Euro. I asked about the strep test, whether they were likely to call us if it developed into strep in a few days, as is done back home when you get a negative test, and there was a guffaw from the desk team, “Bah, nee, we don’t do that here. It comes back negative 99.9 percent of the time,” and I nodded, but thought of that .1 percent time when I got the call that indeed, E had strep after all. “If she gets worse, you return,” said the clerk, and fair enough, when the strep test itself costs about two bucks. We went down the stairs and onto the street, where E promptly threw up. She was still gagging from the swab. We made it down the block to the nearest Apotheke, and the big sign on the storefront proclaimed “We speak English,” which I appreciated since M had gone ahead to the pick up some applesauce at the grocery store. But alas, that was a bit of false advertising, however the pharmacist could easily read the typed prescription our new doctor had carefully prepared for us, and she disappeared into the back of the store, dug around a bit, and returned with a European version of liquid Tylenol, which both E and I sighed with relief to see. I carried E home on my back this time, and we gave her some medicine that she says is not nearly as sweet as at home, and we tucked her into bed and when she awoke the fever was gone and has not returned since. This was a helpful episode in that it revealed two important things to E’s lackadaisical parents: that (1) up until now we have not been prepared for any kind of emergency at all, and (2) we are less certain than ever that our health insurance will work here. The neighbors are alarmed that we do not have travel insurance, and warn us that we should really look into this immediately, because imagine a hospital stay of any duration, and suffice it to say they’ve raised our blood pressure just a notch. No doubt others can relate to this feeling if they’ve ever tempted fate by delaying the start of new health insurance and crossed their fingers in the meantime. M and I are crossing our fingers now as we send this minor insurance test back to the states for the results. Make sure to look into insurance. We require all our US exchange students to get our insurance here in Austria because claiming things back from the insurance in the States is tedious and does not work most of the time. If you have any opportunity to get insurance in D I would suggest it – the co-pays will get even less in the end! I do love the examining table – my nephews would love going to see the doctor if they had one here!!! Hmm, good advice, Heidi. This is what we need — info from people who know. We will do more asking around. Thanks! On our sabbatical in London, we signed up with the National Health Service at our local clinic. Our doctor was director Jonathan Miller’s wife. We never saw her but it was our brush with fame. When I was an exchange student in Norway (a hundred years ago), I just received their free national health care — as do all residents and visitors. I think my host family had gotten me on the program, but it was totally free and not a big deal at all. Not sure how the system works in Germany, but my guess is even if your US insurance covers your care there, coverage by their national program (if you are eligible) would be much more affordable. Check with Fred & Barbara, if you haven’t already (they have been in Italy for the past week). As I remember it, we California students were insured through something called “Barmer Ersatzkasse”, and it was totally free for routine stuff.